A "non-elastic" polyester blend for use with our wind chimes. With very high durability, and great strength this Single Braided 1.8 mm cord is excellent for use outdoors, and is resistant to the effects of water, wind, sun, abrasion, chemicals, and salt. Holds up well to sea spray, desert heat, and mountain winter weather. 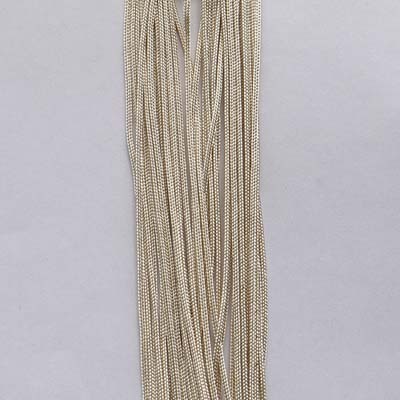 Cord is shipped without spool (un-spooled). Length is 20 Yards (60 feet). Most Chimes of 27" to 74" overall length and 35 lbs or less would do well to be repaired with 1.8 mm cord. Cord is un-waxed and easy to tie. Grommets (AKA eyelets or cringles) should be used with all "through the tube" style chimes. We do not stock these. WHILE WE DO NOT RECOMMEND RESTRINGING WIND CHIMES YOURSELF, WE DO BELIEVE THAT GOOD RESULTS CAN BE OBTAINED BY A PERSON WITH AVERAGE CRAFT ABILITIES. A proprietary polyester blend for use with our wind chimes. With very high durability, and great strength this Single Braided 1.8 cord is excellent for use outdoors, and is resistant to the effects of water, wind, sun, abrasion, chemicals, and salt. Holds up well to sea spray, desert heat, and mountain winter weather. Cord comes without spools (unspooled). © 2019 Whimsical Winds Wind Chimes, all rights reserved worldwide. Whimsical Winds eCommerce.